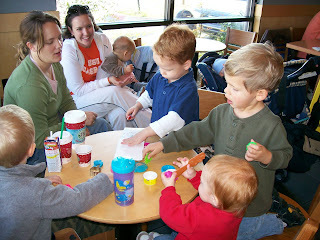 This morning Dawson and I met a few friends at Starbucks. 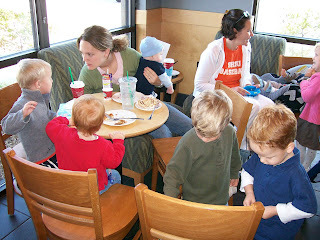 All of the kids enjoyed some delicious baked goods and many had the kid's hot chocolate (only $1, a very good bargain at Starbucks). After eating, the kids played some games while the moms enjoyed some adult conversation. This was a very special treat for us this morning. The boys (Hutton, Carson, and Dawson) play magnet games while Callaway finishes her cinnamon roll. All the kids playing with play-doh.